Imagination is a quality more often celebrated in movies for the young, but that doesn’t mean we adults don’t crave a bit of childlike wonder, too. 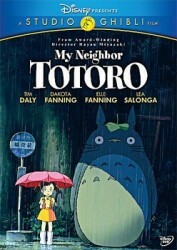 Break from routine and open your mind to the joyful story of My Neighbor Totoro. Two young girls move with their father to a new home and discover a world of whimsical creatures: a riot of soot sprites, a fantastical cat bus, and three sizes of fuzzy spirits that mysteriously appear and leave delight in their wake. The animation style is energetic, and the inventive details of expression and gesture bring touches of heart-tugging realism to a tale that will entertain all ages. Crafted by the famed Studio Ghibli, the film can be viewed in English or in the original Japanese. Choose this title or another of the World Language Movies You Can Watch with Your Kids (or on your own!) for the final days of our Summer Reading Program. There’s still time to enroll and let us know what you’ve been reading and watching in June and July, though be sure to submit entries by July 31.